I was expecting a war. What I found was, at worst, a cool — not even cold — détente. And a lot of unanswered questions. Maybe we can all get along after all. Recently, Streetsblog disclosed the terms of a settlement between LADOT and a small group of homeowners in the Cheviot Hills area regarding the bike path planned to parallel the upcoming Expo Line extension into Santa Monica. The group of seven homeowners lining the south side of Northvale Street had challenged the environmental documents used to approve construction of the bikeway behind their homes in a pair of lawsuits. The settlement provided for the usual options, such as extra lighting and a privacy wall to keep prying bike eyes and noises out of their back yards. But it also included a provision for public meetings to gather input on the design of the Northvale segment bikeway. 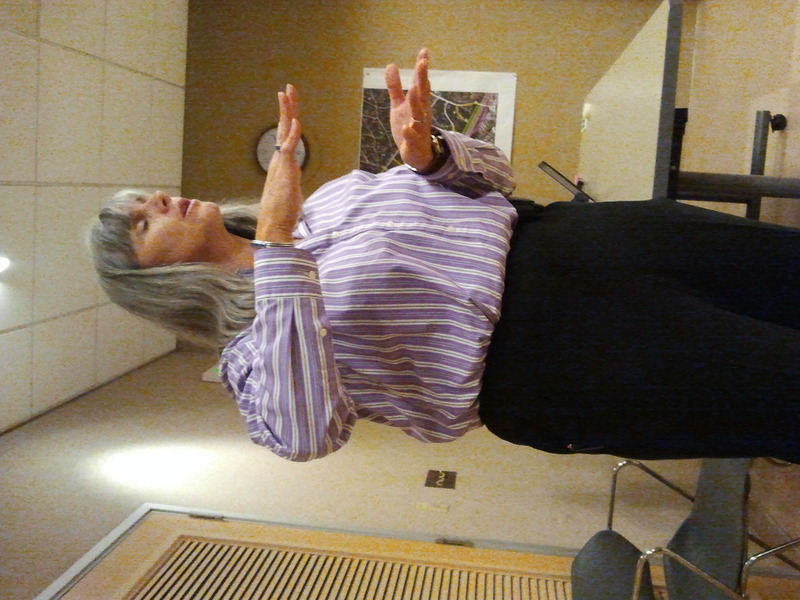 The first of those meetings took place last night at the Palms Rancho Park Community Library on Overland Avenue. A capacity crowd in attendance when David Somers of City Planning and LADOT Senior Bicycle Coordinator Michelle Mowery opened the meeting; every seat in the small room was taken, and people lined all three walls in the back and leading to the front of the room. This time, it wasn’t bicycle supporters packing the house; instead, the room was filled mostly with local residents, many of whom appeared to arrive primed for anger. And the outnumbered bike riders seemed ready to fight for their pathway. At least, that’s how it started out. Mowery noted that this was just the start of the final stage in a design process that had begun 12 years earlier; one that had considered — and rejected — a number of options along the way. And that funding requirements dictated that, unlike the first phase of the bikeway which is made up largely of on-street bike lanes, the entire second phase leading from Culver City to Santa Monica would be a Class 1 bikeway, either built off-road or physically separated from motor vehicle traffic on the street, depending on the location. However, she also made it very clear that this meeting concerned only the section of the bike path running behind Northvale between Motor to Overland Avenues, turning away any questions that didn’t specifically address that area. And she stressed that city planners had as many questions about the design of this project as the people in the audience did. And that this meeting was less about answering their questions than it was about gathering the input city engineers would need to design the final project. Some questions she could answer, some she needed to get the answers from them. And some would depend on the work by city engineers in the days to come. The design problems, she said, stem from the fact that the train tunnel underneath the I-10 Santa Monica Freeway is too narrow to accommodate a bike path, as is the trench the train will run through in the Cheviot Hills neighborhood. As a result, planners are forced to move the bike path away from the railroad right-of-way at that point. Just where was a matter to be determined, based at least in part on the input from this meeting. Placing the bikeway on Northvale itself wasn’t practical due to a steep 10% grade that would tax the abilities of many bike riders; city planners try to limit hills on bike paths to no more than a 5% grade. The same problem ruled out most, if not all, of the other streets in the area, as well. That meant the bike path would most likely have to go behind the homes, using a combination of existing Caltrans and sewer easements west of Motor before returning to the trench. After that, options include cutting a 12 foot ledge into the side of the trench, or placing it at grade next to it, while a separated bikeway might be considered on Motor to get riders past the freeway overpass. The project, she said, was to be funded with Federal Transportation Enhancement Funds which became available in July of this year. Estimates were based on in-trench placement with retaining walls to hold back the earth next to it; anything else should be less expensive. Input from last night’s meeting was to be considered in designing the bikeway, with a 75% completed design due back at the next meeting in January of next year. The construction phase is planned for January 2015, and actual work should begin in July 2015 in anticipation of opening to public use in July of 2017. Mowery responded that they were there to collect input for the engineers to consider. “What we do know is that it is a bicycle path, and a bicycle path is, by definition, separated from traffic,” she explained. Audience at Expo Line Northvale bikeway meeting. For the most part, the comments that followed were surprisingly constructive. A few people said the bikeway needs to accommodate riders who would travel from the coast to Downtown, to the disbelief of many in the room. Others asked for access points allowing riders to exit the pathway at the library and local schools, as well as the Westside Pavilion shopping mall a few blocks away. Access points were, in fact, one of the key points of contention. A number of commenters — some of whom identified themselves as part of the seven who had filed suit — asked for no access points leading into their neighborhood between Motor and Overland, while others were willing to consider a single access point at Dunleer, roughly a third of the way through the neighborhood. Still others — mostly bicyclists, including Bicycle Advisory Committee member Jonathon Weiss — wanted to be able to access the neighborhood at any of the seven streets that intersect Northvale. As bike advocate Eric Weinstein pointed out, it is an inviting area to ride through, and multiple access points could entice riders to exit the path on their way to nearby Century City or Beverly Hills. Which is exactly what at least some of the residents at the meeting were afraid of. One woman pointed out that homeowners banded together to buy and gate the land leading to the trench behind Northvale a number of years ago, after experiencing problems with fires, as well as homeless people taking up residence behind their homes. Others expressed concerns that people along the pathway would get into their backyards and peer into their homes, and that they could be liable if anyone got hurt trespassing on their property. Mowery responded that steps would be taken to address those concerns, including reducing fire risk and keeping people out of their yards. Meanwhile, bicyclists stressed the need to be able to get off the pathway in case of an emergency or to avoid a dangerous situation — especially if the path is built below ground level, where riders won’t be visible to those on the street or in nearby homes. It was also pointed out that some that people who live in the neighborhood will want to ride the bike path with their families, as well, and wouldn’t want to have to ride all the way to Motor or Overland just to get to it. That seemed to result in grudging acceptance of the need for at least some access points to and from the bike path from the surrounding neighborhood. Even if at least one resident was concerned that bike riders would use the pathway to burglarize their homes before pedaling off into the night. Note to non-bike riders: It is really, really hard to ride a bike with a 60” flatscreen balanced on your handlebars. Which is not to say it can’t be done. But thieves are far more likely to drive to your house so they can clean you out without having to worry how they’re going to get all that loot home. 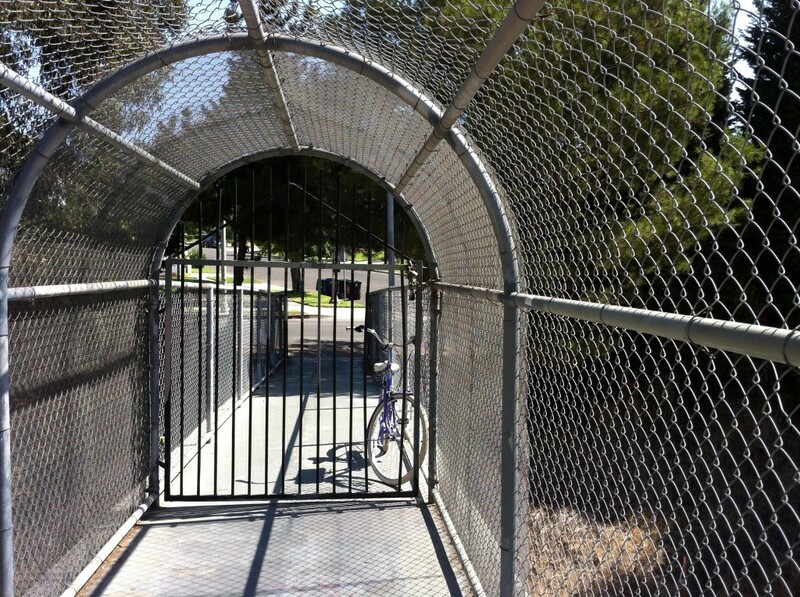 That led to calls to lock the gates at night, just as the single pedestrian bridge leading from the library and park into Cheviot Hills is supposed to be locked from 9:30 pm to 6 am. Mowery pointed out, though, that studies have shown installing bikeways on abandoned railways like this usually results in a decrease in crime as more people travel through the area. Meanwhile, the LACBC’s Eric Bruins explained that homeowners shouldn’t want the access points to be closed at night because it will create exactly the sort of problems they say they want to avoid. Locked gates, he said, would let dangerous people know they can hang out there without fear of being discovered or interrupted. He added that many women are likely to use this path for late night commuting, and closing the access points will put them at risk. Weiss explained that, for security reasons, there was a need to provide good sight lines for people riding the bike path, especially women. And as a result, it should be built at grade for greater visibility. However, building at grade could jeopardize some of the stately trees along the route that at least one audience member said should be preserved. Bruins responded that there might have to be a trade-off; a street-level bikeway could require a difficult choice between saving those trees and preserving on-street parking. In addition, there were multiple requests for street signs and wayfinding signage along the path, wherever it ends up being built. According to Mowery, this was already under discussion; in fact, the city has a half-million dollar wayfinding program under development now. The devil, as they say, lies in the details. Whether everyone, or anyone, for that matter, will be satisfied with the plan the city will come back with in January is won’t be known until that plan is unveiled. The local homeowners present last night wanted far more answers than they got, though they seemed willing to offer their input once they realized they weren’t going to get them, at least not now. And the bike riders who came in prepared for debate focused more on design details as the night wore on. There was little tension left in the air when the meeting ended. For the most part, people on both sides milled about, discussing various fine points with one another. And perhaps realizing that there are no sides to this debate. Just details to be worked out for everyone’s benefit. While certainly roving groups of flat panel TV thieves on bikes seems comically unlikely, crime is a fact of life in parts of West Los Angeles close to the area outlined here. There are regular incidents of home break ins where jewelry and cash and other small, expensive items are taken. These crimes appear to be executed on foot, not by driving up to the target residence. Certainly these same types of crimes could easily be accomplished with a back pack and a bike. And a nearby bike path could (how likely I’m reticent to guess at) provide a legitimate option for these types of home break in thieves. I think crime is a valid concern to take into consideration along with the many other factors influencing how to route this bike path. Perhaps regular bicycle police patrols along the path could address such concerns? What’s to stop someone from rolling up to these residences on a bike using the existing roadways? Would a bike path really make all that big a difference? Police patrols along bike paths would be a welcome sight. A good size block wall should solve most of the issues. There is a wall alongside the Expo bike path near Culver City and that seems to be acceptable. $500,000 to figure out which streets intersect bike paths, stamp out signs and prepare poles then drive a work truck to the sites and install them. $500,000. I could do the work and would be glad to do it for $50,000. Jesus Christ and this is going to be built in 2017!? 2017?! Is there anything that we can act on now that will happen before my kid graduates from college?! That half a million dollars is for wayfinding signs for bicycling routes throughout the city. Which would include upcoming bicycle friendly streets, bicycle paths and streets leading to bicycle paths. It takes years to plan and build bicycle paths, but several miles will be or have been added to what was 50 miles of bike paths two years ago. There is a bicycle path that is being built next to the Metrolink right-of-way along San Fernando Rd in the San Fernando Valley that is anticipated to open in 2014. 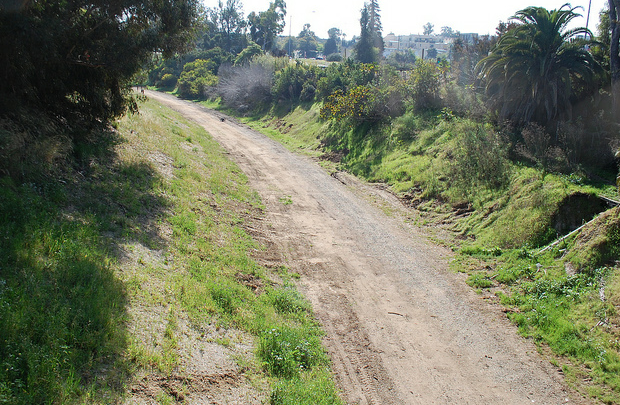 A bike path was opened in 2012 next to the Orange Line extension along Canoga Ave and another bike path next to the LA river in the west end of the San Fernando Valley in 2012 (about 6-miles total). Universal/NBC recently agreed to pay $13.5 million for a 6.5 mile extension of the LA river bike path from Griffith Park to Whittsett St in Studio City. Yeah, the wayfinding system will be much more extensive than just a few signs along bike paths. It’s intended to direct people to destinations (neighborhoods, Metro stations, parks, libraries, museums, shopping districts, etc.) along the entire existing bikeway network, plus the sharrowed routes and bike-friendly streets in the 5-year implementation strategy. The scale of the effort is actually pretty impressive. The path probably will not have as much visibility to neighbors and/or the rare police car so it would seem to be a good escape route. Not an expert here just saying it seems a legit factor to consider. Anecdotally, I can recall that crimes such as burglaries and stick-ups can be facilitated by having a bike path because police cars can’t pursue people as easily. In Berkeley, there a ~500ft path connecting 2 cul-de-sacs that would require close to a mile of driving to travel between using the normal street network. Promises of patrols are worthless. Anyone who has been around more than a year, knows that all of the centrally-managed LA City resources, especially “basic car” police patrols, simply vanish without notice. That’s why prevention is so important, as in not allowing the attractive nuisance to be built in your neighborhood. City Hall cannot be trusted to protect us from what it creates – or rather, it _can_ be trusted to not protect us. I wish I could be more optimistic, but I’ve witnessed and experienced enough violent, street and gang crime in my life, in Los Angeles, including transit-related, and the generally pathetic response from law enforcement, that I submit the concerned homeowners are actually underestimating how bad it will get. there. That way, you have perfect access, too. Between Motor and where Northvale intersects Northvale, it can follow the 75-ft-wide restricted-use easement between the backyards and 100-ft-wide railroad.